Level 4 threat hunting is typically defined in various frameworks as data science based automation. PatternEx’s Virtual Analyst Platform (VAP) automates data science and increases the maturity of threat hunting teams. At the core of the Virtual Analyst Platform is an easy-to-use and powerful AI architecture built for analysts to quickly create, modify, and test AI threat detection models—all without coding or requiring data science expertise. Watch our latest on-demand webinar to learn more. In my experience, today’s security analytics fail to detect advanced, targeted attacks. What is needed is something built from the ground up to detect threats that traverse multiple tactics and entities over long time horizons. PatternEx’s concept of ‘virtual analysts’ does exactly that, and has helped improve our SOC efficiency." 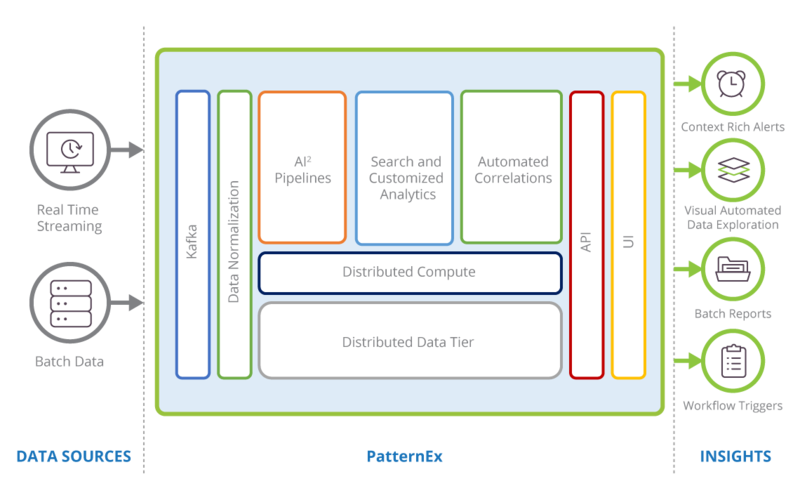 AI Pipelines The pipelines use big data architecture for behavior modeling of users, hosts, applications, and other entities. The AI classifies events as benign, malicious, or suspicious with a given confidence level. Analysts can choose to label the analysis to improve the AI automation. 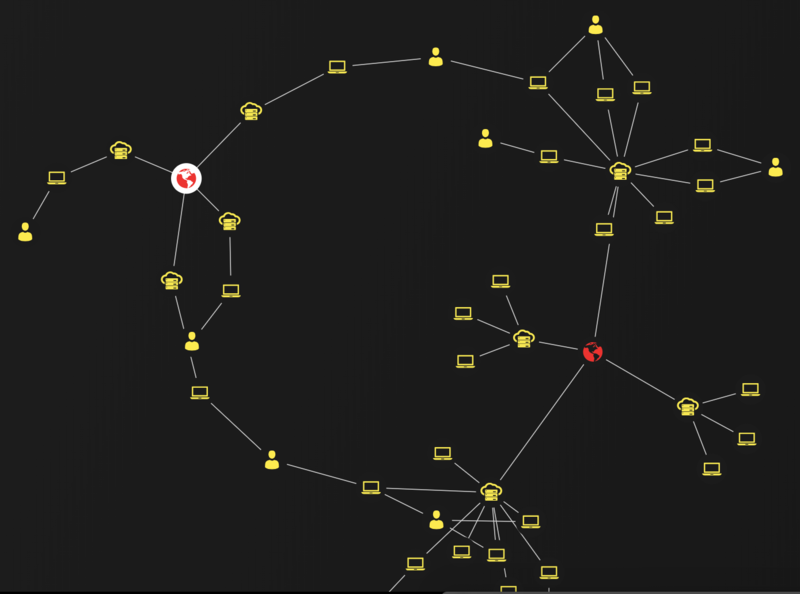 Predictive and Automated Correlation Engine This engine “connects the dots” and creates an attack story for current and anticipated attacks based on relationships amongst system, network, data, and/or user behaviors. Customized Analytics and Transfer Learning Engine This component enables the system to get smarter with analyst inputs. Transfer learning makes it possible to share AI threat detection models without sharing confidential data. The AutoCorrelate engine reduces the time it takes to do an IR investigation or threat hunting task by 20x. 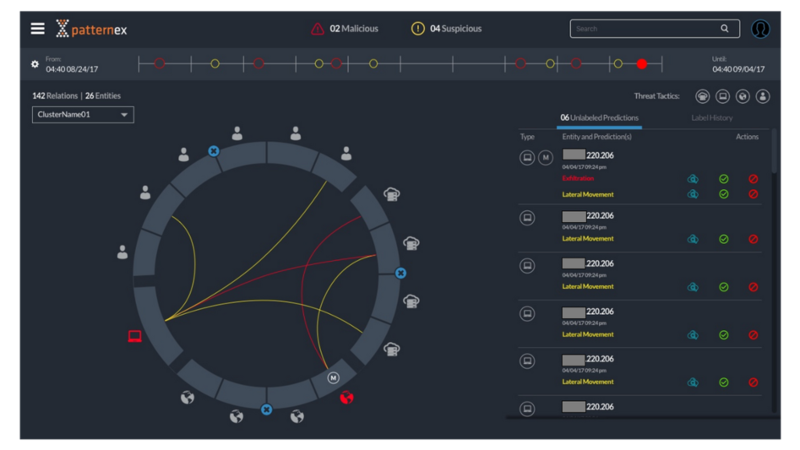 Through automatic relationship discovery across all entities (user, URL, IP, etc..) an intuitive graph is shown along with suggested threats and anticipated threats. You have Tera- or Petabytes of data. No problem—the system can scale easily to process data in real-time or via batch logs. But you don’t want to spend hours supporting, tools, and tweaking an AI system. Again, no problem—PatternEx works out of the box and automatically gets smarter over time. Watch Dr. Mei Lam, PatternEx data scientist, discuss AI best practices to make it easier to find correlated security events (and anticipate threats)—without writing rules.